I guess I know I’m even busier than my usual busy when I can’t come up with the time to post here. The last few days I’ve been getting home late and falling asleep on the couch. I’m only checking email or using my home computer a couple of minutes in the morning… Once again, I either get enough sleep or I get everything done. Sleep wins this week! I’ve ridden my new bike to work twice this week. It’s very light, agile, and fast (weighs at least 10 lbs less than my old bike) and I’m enjoying my time on it. Well, the way home still isn’t that much fun after a long day, but coming to work is zippy so far. It’s been fast enough that I am having to learn to pay more attention to obstacles, pedestrians, and traffic (like the school bus that nearly ran me down today) because I’m coming upon them more quickly and have less time to react. My first ride on the new Bianchi was with people from work when we did a 20+ mile route around town, and while it wasn’t as fast as many road cyclists like to go, I felt able to keep up on my new contraption even while I was learning a totally new system of brakes, shifting, and steering. Even coming down the left lane of Meridian Street! One big benefit (and one of the reasons I chose this bike instead of another flat handlebar bike, which I thought I wanted) is that the rotated hand position above the forward-most set of front brakes makes my ergonomic injury (basically tennis elbow) feel MUCH better, instead of aggravating it like the traditional positions of using a mouse, rowing, and riding a flat bar bike do. I think I’m actually stretching the muscles in a way that combats my computer use! I have a few brightly-colored wicking shirts and tanks which I wear to hopefully avoid getting smushed by inattentive drivers. A 10-year-old girl yelled from her porch the other day, “I like your shirt!” This is great because David HATES that pink shirt (like most pink things) and I trust a little girl’s fashion sense more. I yelled my thanks. In other news, I recently had the chance to attend a benefit dinner for Lambda Legal through a ticket I won at work. I don’t discuss this topic much here, but GLBT rights are something I feel strongly about. I decided to go despite my discomfort with more formal, social occasions, primarily because I knew it was a good development opportunity. Even introverts should be able to interact and network with executives from their company. Finding a suit that still fit was a humorous affair, but fortunately I had one in my closet that worked. It was a lovely dinner–my eating preferences were even accommodated without too much hassle–and I met several vice presidents from my company. Bart Peterson, Indy’s former mayor, received an award for his work to make our city a more just place to live. Would you believe it’s only been in the last couple of years that it’s no longer legal to fire or evict someone in Indianapolis because he’s gay? Lambda Legal represents cases like these, or when HIV-positive people are denied government employment based on their health status, or lesbians who are denied fertility treatments because their doctors decide it’s morally wrong to let them raise children. What century is this?? 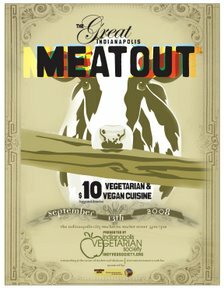 The next night I met friends for Meatout, which was held at City Market this year instead of a church basement. The venue was much more pleasant but the event seemed rather sparsely attended. I don’t think it’s advertised all that well. Some of the food was kind of blah, but I really enjoy going because I can eat ANYTHING there and it’s great to hang out with like-minded folks. Amanda and I staffed a table for IHRS and I carpooled with Nicole and Ainsley, who didn’t fall through the upstairs railing! I even won a Whole Foods Market raffle prize, which included a book I’d been wanting to read by a cattle rancher who went vegan, plus a cookbook, spatula, and a couple of snacks in a reusable shopping bag. The rest of life has been bunny stuff lately, and a bit of experimental cooking. I tried a new recipe this week with spaghetti squash, spinach, chickpeas, sun-dried tomatoes, basil, and of course garlic and onion. A little salt and some cheese and that’s it! It was weird but pretty good. This entry was posted in Dental/Health, Indianapolis and beyond, Recipes, Rowing/Biking/Sweaty Stuff, Social commentary/rants, Vegetarian by Amy. Bookmark the permalink. I saw a lady on a bike like your new one yesterday and I thought “I wonder how Amy likes her new bike?” And here you go writing about it today. How ’bout that?! Do you know about World Vegetarian Day? Perhaps I’ll find a button for my sidebar or something. I try to be pretty minimalist about that. Then when there’s a WordPress upgrade it all disappears anyway!